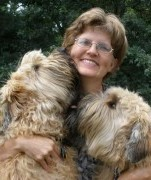 She was a therapy-dog handler who took her two soft-coated wheaten terriers, Wheatie and Toby, to nursing homes, convents and hospitals, as well as programs aimed at reducing stress for college students. Anesthesiology. She was only 52 when she passed away from complications following a heart attack. Well known for her caring concern for her patients, Dawn was the kind of doctor every pain patient dreams of finding. Dawn's approach to her patients was described by her colleague Dr. Cheryl Bernstein in the Pittsburgh Post-Gazette obituary. “...she dealt with pain-saddled patients in a way that belied the stereotype of rushed, indifferent doctors. She listened and gave them the time to tell their story, as though that was the only thing going on. She outlined a really thorough plan for them...and gave patients hope that they could manage their pain." I first met Dawn almost three years ago when she was finishing up work on her book The Woman's Fibromyalgia Toolkit. She invited me to look over the manuscript and make suggestions, then asked me to write a review to be published in the front of the book: How Alcohol Affects Your Heart. Together we developed the Fibromyalgia and Family Impact Survey, posted it online and invited FM patients to complete it. The response to the survey was phenomenal––more than 6,000 people participated! The results of the survey were subsequently published in the journal Musculoskeletal Care. I particularly remember something Dawn told me that especially endeared her to me. She said when she spoke about fibromyalgia before a group of doctors, she always asked them how many have FM patients and most of their hands would go up. Next, she asked them how many enjoy treating FM patients and most of the hands would go down. Then she would tell them that she loves treating FM patients because they are the most motivated of all of her patients. She would go on to explain that her FM patients wanted to get better so badly, they did the best job of following the treatment instructions she gave them. Too often there is still a perception that people with FM are malingerers, that we don't really want to get better. But Dawn saw what those of us with FM have always known––we very much want to get well and will generally do whatever it takes if we think it might help us to improve.